This is an open source Sierra style GUI that you can use to build your own game. Updated to be compatible with AGS V2.5. Includes source code, documentation and sprites to use in your own creation. 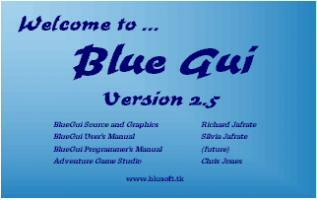 The BlueGui implements the following features in a fully scripted, open source GUI that can be taylored to your needs. The source code was updated 10-27-02 to be compatible with AGS V2.5. A couple of new AGS features required some changes be made to maintain compatibility. In addition a few minor refinements to the comments and script header definitions were also made as well as reducing the file sizes. The tutorial is a large download because it is extensive and it demonstrates the use BlueGui's many features. There is also a very nice user's manual, prepared by Silvia, that can be downloaded seperately. If you wish to dive straight into the source code then just click on the download button on this page. Go to the website to download the tutorial and the manual. Basically, a quake console logging stuff for you, useful for debugging purposes. I am against tools in the database frankly. Please consider updating this to the latest version of AGS, (v2.72.) Thanks! Great! You can create BRILLIANT GUI's easily!